It’s fair to say, looking back, that the Norwegian thrash band Inculter have had a meteoric career so far. To mix the metaphors, they took off like a rocket that had an explosive lift-off but have then gathered speed and altitude as they’ve soared ever higher. It’s also fair to say that they’ve reached the stratosphere with their new album Fatal Visions. I say this as someone who finds most thrash albums by modern bands quickly forgettable, and easily interchangeable. Fatal Visions (which will be released by Edged Circle Productions on April 12th) is neither forgettable nor floating in a sea of mediocrity with all the other nearly identical fish. Even for a fairly jaded thrash listener such as myself, it makes an explosive and thoroughly eye-popping impact. When you hear the whole album, as we’re giving you the chance to do right now, you could easily mistake Inculter for a group of grizzled veterans, so assured is their songwriting and so skillful is their performance. But they are still quite young, which only makes the accomplishments of Fatal Visions all the more impressive. 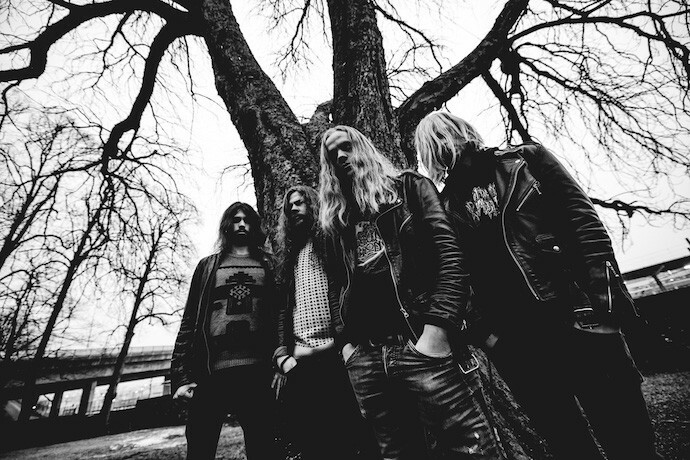 As for that rocket-like ascent, their 2013 Stygian Deluge EP sold out fast and led Darkthrone’s Fenriz to anoint them Band of the Week. 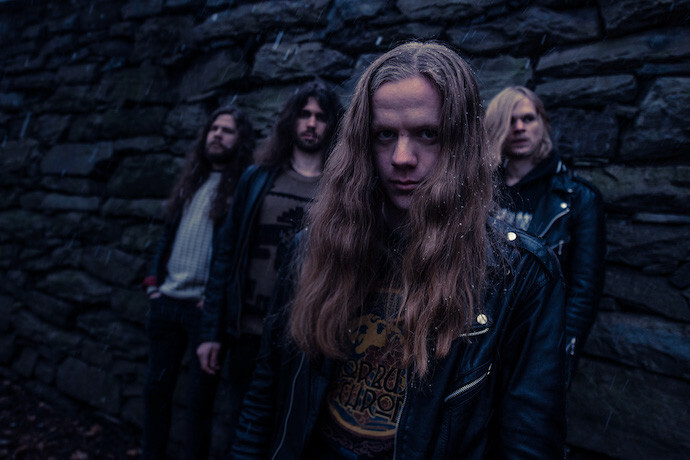 Still not yet in their 20s, they released a debut album in 2015, Persisting Devolution, which dramatically expanded their fanbase and led to supporting roles in sold-out concerts by the likes of Mayhem and Kvelertak. But as forecast above, Fatal Visions takes the band higher still. Inculter’s previous releases were eye-opening; this one really is eye-popping. Featuring a powerhouse production (by the band) and mastering by Enslaved’s Herbrand Larsen, the record has a raw, feral, fire-breathing energy and an atmosphere of savage, bestial wildness in its exuberance, yet is executed with tremendous technical skill and stylistic flair. The songwriting is also top-shelf, as the band create the kind of dynamic experience that keeps you on your toes, and locked in for the whole thrill-ride. The music is mainly full-throttle — the kind of supercharged, fist-pumping surge that floods adrenaline through your system and spins your head around. The album is filled with fiery, furious, flashing fretwork and glorious, fanfare-like chords that seem like emblems of heavy metal majesty. The drumming is also excellent — capable of just powerfully hammering away with a lot of familiar thrash-rhythms, but also erupting in bursts of jaw-dropping extravagance. And the raw, braying and snarling vocals add to the vicious, evil qualities of the songs. But the album isn’t just relentless, non-stop speed, and that’s where the songwriting maturity shows. The band pick their moments, and pick them well, when they slow the pace way down, and change the mood, collapsing the pace into gruesome crawling horrors, and flavoring the atmosphere with occult doom, gloom, and ghastliness. You get a taste of that in the very first track (“Open the Tombs”), and bigger tastes in “Shepherd of Evil” and “Endtime Winds”, the latter of which is a prime example of the band’s talent for tempo dynamics. It’s a portrayal of utter misery and hopelessness for the first minute and a half before it cuts loose, and it includes a beautiful, melancholy solo in a grand and glorious finale. In between the rampant speed and the morbid crawling, Inculter also insert mid-paced movements, the principal object of which is to get you to bang your head like a crazy person — and they achieve supreme success in that objective, especially in the closing triptych of “Towards the Unknown”, “Fatal Visions”, and “Through Relic Gates” — the last of which is mid-paced for more than half the song before it rockets the album to the finish line trailing flames of glory. I mentioned the soloing in one song, but there are wonderful and varied solos scattered across the album. They don’t feel tacked-on, like something obligatory, but are instead integrated with what’s happening in a way that feels natural, sometimes sending a surge even further into the red zone, and sometimes deepening the sense of eeriness or misery in the slower segments. Fatal Visions really is a wonderful album to experience from start to finish, and it doesn’t wear out its welcome with repeated spins. Thrash addicts will eat it up, and even the more jaded and hard-to-impress thrashers among you should give it a serious listen. Edged Circle Productions will release Fatal Visions on CD, vinyl LP, and cassette tape formats. The release date is April 12th (with a North American release date of April 26th). Credit to R.K. Valbo (Obliteration, Void Eater) for the eye-catching cover art. Interesting that you find so many modern thrash bands to be dull and forgettable. I feel the opposite. I think we are living through a second golden age of thrash. There is so much high quality thrash out there right now, as much as there ever was in the 80’s. 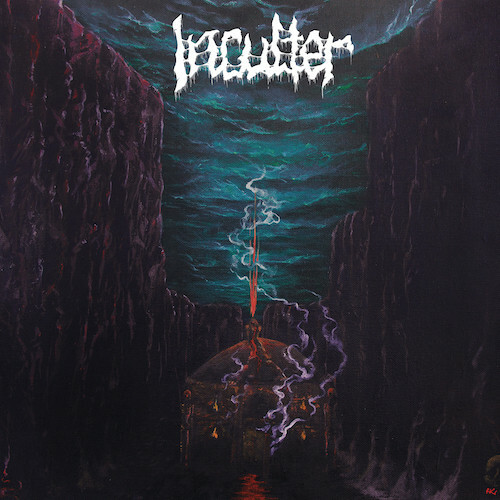 Inculter are definitely among the best, along with Antichrist, Hexecutor, Power Trip, High Command, Condor, Ripper, and more. I think those bands you mention fit into a specific kind of subgenre that employs a filthy sound backed up by scathingly dirty riffs and elements of speed and crossover. The rest of the modern thrash bands, starting, say, with Lych King(? )—so the vast majorty–are boring at best. My point is that you basically mentioned ALL interesting thrash bands. Except Schafott and Bunker66 and Subtype Zero. Also, I suppose there might be some confusion what is meant with “modern thrash”, as the term could refer to thrash bands of recent years/decades (excluding at least those who did their most significant contributions in the 80’s or 90’s), but also to bands with a more modern style/sound. Anyway, the new Inculter sounds ripping! Didn’t check out their debut until recently either, but damn, this is yet another great thrash band from Norway. Hah I always somewhat dispense w nuance when reacting here. I type on my phone, mostly, in moments between tasks/meetings etc. Youre right of course, but I still feel most of the thrash that comes out bores me quickly. I feel it has to do more w my having been around for a while and keeping up to date, than w the overall quality of bands. I have the same w other genres. I guess Im not easily wowed anymore. I wholeheartedly agree w your recomms, though. Nekromantheon, Speedtrap etc are grand. Do try Schafott.